Description: The trail is paved and flat for the first mile, passing thorough meadows and picnic areas on the floor of the valley, then entering a magnificent forest with towering redwoods, arching bay trees, and lush ferns. Here the trail is packed dirt, but still wide and with little elevation gain, following tiny Redwood Creek. There are several steeper and more challenging trails branching off from the Stream Trail which provide alternatives for those who have more energy to burn. Restrooms are available along the Stream trail. Where to meet: We will meet in Redwood Regional Park at the north end of the parking lot which is about a quarter of a mile beyond the kiosk within the “Redwood Gate” 7867 Redwood Rd, Oakland, CA. 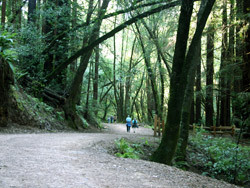 This entry is located off the north side of Redwood Road about 2.25 miles east of Skyline Blvd. This is a popular park on weekends, so please allow extra time (10 minutes?) to walk from your parking space to the north end of the parking lot. What to bring: Binoculars if you have them, good hiking shoes or boots for the trails, layered clothing for variable weather, water, windbreaker, snacks. Hiking poles are optional, but a good idea for the longer option. Directions: Take Hwy 13 south to the Redwood Road Exit. Turn left off the exit, and follow Redwood Road east, 2.25 miles past Skyline drive. Turn left into the “Redwood Gate”. Follow the pavement to the end of the road, where there will be a parking lot. We will meet you there at the north end of the parking lot. Carpools: If you need a ride or can give a ride, call or email Audre (audrenew@gmail.com, 510-548-0530) a few days in advance for arranging a pickup near your home or at a BART station. PUBLIC TRANSIT: see AC TRANSIT by calling 511, or on the internet at 511.org.